VRsus guARdian is a networked, stealth-based game between AR and VR. 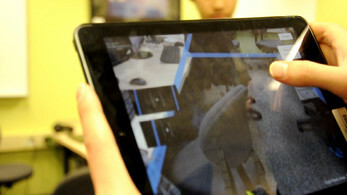 The game utilizes ARKit to scan the room around the player and builds a shared world where both players can interact with one another. The game sets a 'VR Player' who's trying to steal a relic against an 'AR Player' who uses an iPad to set up traps and search for this thief. Make sure that you're on the same network as the PC client and start the game.